Chocolate is a sweet treat that you may hate to overeat but cannot resist whenever you see it. The delectable flavor of chocolates and the way they melt in the mouth is even more wonderful. Apart from lifting up the mood, chocolate is the best cure to nurse the broken heart. And if you eat the right chocolate in the right amount, you will be at the receiving end of several health benefits. Chocolate is the most comforting food item loved by people of all age groups. 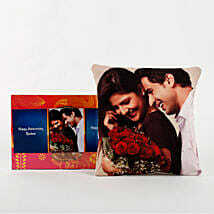 And that’s the reason they make the perfect gift options for various occasions. 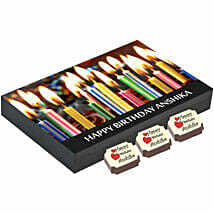 At Ferns N Petals, we have come up with an extensive collection of yummy personalized chocolates online. Available in a variety of flavors such as roasted almonds, butterscotch, and fruit & nuts, these chocolates are absolutely delicious to relish along with your friends and family. 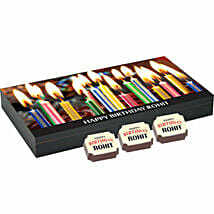 You can get the name of your loved ones and a short message printed on these chocolates to gift on their birthday, anniversary, Friendship Day and several other special occasions. You can also get your dear one’s photo printed on the chocolate box to give the gift a personal touch and bring a smile to their face. 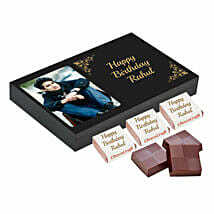 Whether your best friend’s birthday is coming up, you want to impress your sweetheart on Valentine’s Day or celebrating Christmas with your folks, personalised chocolates are great gift ideas to offer your loved ones along with loads of love and warm wishes. 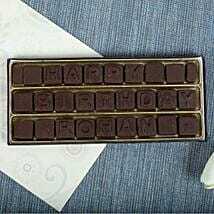 Our customized chocolates online are perfect to send across the message of love to your friends and family by getting their name and short message printed on them. 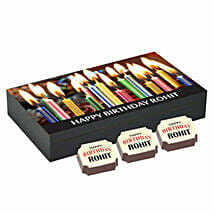 You can choose from the different personalised chocolate boxes available with 6, 9, 12, 18, and 27 chocolates. 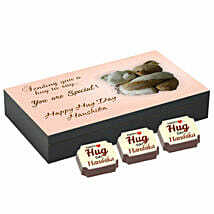 Adorned with the personal touch, these chocolates will taste much better and remind your dear ones of your love and care for them. You can order them online and get delivered to the doorstep of your friends and family via our hassle-free same day and next day delivery service.